Fundamentally, the sacrament of Holy Orders creates a priest. There’s a little more to it than that, of course - as the Catechism’s section on Holy Orders says: this “is the sacrament through which the mission entrusted by Christ to his apostles continues to be exercised in the Church until the end of time: thus it is the sacrament of apostolic ministry. It includes three degrees - the orders of bishop, priest, and deacon”. (Catechism, 1536). To know what a priest is we have to know what a sacrifice is. Nowadays the word “sacrifice” is used in many different ways. But in its strict, original meaning, a sacrifice is the offering of a gift to God by a group, through the agency of someone who has the right to represent the group. The purpose of such an offering is to give group worship to God; that is, to acknowledge God’s supreme lordship over mankind, to thank him for his blessings, to atone for human sin, and to beg for his benefits. It is not that God needs our gifts - everything that exists was made by God in the first place. Items of great worth by human reckoning would have no value in God’s eyes. Until Jesus gave us himself as the perfect gift in the sacrifice of the Mass, nothing that man could offer to God was really worthy of God. Sacrifice, in short, is prayer in action. It is the prayer-in-action of a group. And the one who offers the sacrifice in the name of the group is the priest. At the Last Supper Jesus instituted the Holy Sacrifice of the Mass. In this new sacrifice the gift offered to God would not be a mere token gift, such as a sheep or an ox or bread and wine, but the gift now, for the first time and always, would be a gift worthy of God. It would be the gift of God’s own Son - a gift of infinite value, even as God himself is infinite. In the Mass, under the appearances of bread and wine, Jesus would daily renew the once-and-forever offering which, upon the cross, he made of himself to God. In the Mass he would give to each of us, his baptised members, the opportunity to unite ourselves with him in that offering. Who would be the human priest who would stand at the altar - the human agent whose hands and whose lips Christ would use for the offering of himself? Who would be the human priest to whom Christ would give the power of making the God-Man present upon the altar, under the appearances of bread and wine? There were eleven such priests, to begin with. (It is not certain that Judas was present at the time the Apostles were made priests.) At the Last Supper, as we know, Jesus made his Apostles priests, when he gave them the command, and with the command, the power, to do what he had just done. He said “Do this in remembrance of Me” (Luke 22:20). It was this power, the power to offer sacrifice in the name of Christ and of Christ’s Mystical Body, his Church (which means you and me united to Christ by Baptism), which made the Apostles priests. To this power of changing bread and wine into his Body and Blood, Jesus on Easter Sunday night added the power to forgive sins in his name. He said “Receive the Holy Spirit. Whose sins you shall forgive, they are forgiven them; and whose sins you shall retain, they are retained” (John 20:22-23). This power of the priesthood which Christ conferred upon his Apostles was not to die with them. Jesus came to save the souls of all people who ever would live, down to the end of the world. Consequently, the Apostles passed their priestly power on to other men in the ceremony which we now call the sacrament of Holy Orders. It was as deacons that these men were ordained, not yet as priests. But it gives us the picture of the Apostles sharing, and passing on to others, the sacred power which Jesus had bestowed upon them. As time went on, the Apostles consecrated more bishops to carry on their work. These bishops in turn ordained other bishops and priests, and these bishops in their turn, still others, so that the Catholic priest of today can truly say that the power of his priesthood has come down, in the sacrament of Holy Orders, in an unbroken line from Christ himself. There are two notable ways in which the sacrament of Holy Orders differs from the other sacraments. 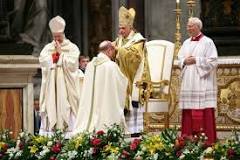 One is the fact that Holy Orders can be administered only by a bishop. Only a bishop has the power to ordain priests. An ordinary priest cannot pass his power on to another. The second way in which Holy Orders differs from other sacraments is that Holy Orders is not received all at once. When we are baptized, we are completely baptised by the single pouring of water. When we are confirmed, we are completely confirmed in a single ceremony. Holy Orders, however, is given by degrees, by successive steps. The sacrament of Holy Orders unfolds itself through three stages as it confers successively the powers of deacon, priest, and bishop. Deaconship, priesthood, and bishopric are the three stages in the sacrament of Holy Orders as it was instituted by Christ. At each stage, as in every sacrament, there is an increase in sanctifying grace. At each stage there is the imprinting of a character upon the soul; each successive character, like a progressively brighter sun, enveloping and containing the one that has gone before. In that character are rooted the right and the power that belong to the order which is being received. For the deacon it is the right to baptise, to preach, and to administer Holy Communion. For the priest it is the power to change bread and wine into the Body and Blood of Christ and to forgive sins. For the bishop, who alone has the complete fullness of the priesthood, it is the power to confirm and to ordain - to pass the power of the priesthood on to others in the sacrament of Holy Orders. For priests (and of course bishops), Holy Orders “configures them to Christ” in a special way so that they can act in the person of Christ the Head. Through the sacrament of Holy Orders, the Holy Spirit imparts that tremendous and almost unbelievable power to call Jesus Christ himself down upon the altar. It is in the Sacrifice of the Mass that the priest exercises the supreme degree of his sacred office. This is the supreme Sacrifice, offered in divine worship in the person of Christ (in persona Christi), by which the priest acts as a true priest of the New Covenant. We must also remember that it is only by this sacred, ordained power to act in persona Christi that the priest has the power to forgive, in Christ’s name, the sins of men. In the sacrament of Holy Orders, Christ has provided us with an essential link to himself. Above all else, Holy Orders makes possible the extraordinary gift of the Sacrifice of the Mass - a gift from Christ himself.